Balance Bead adorns your necklaces clasp and helps prevent it from slipping around to the front. 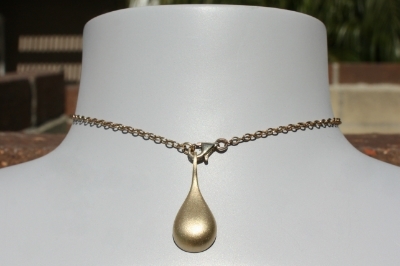 Balance Bead acts as a counterweight: the weight of the Balance Bead should match the approximate weight of the pendant on your necklace combined with the weight of your chain. Is your charm smaller and lighter than a nickel? Select a Small Balance Bead. Is your charm larger and heaver than a nickel? Select a Large Balance Bead. Balance Bead is not recommended for charms which are smaller and lighter than a dime. Step One: Open the clasp of your necklace. Step Two: Slip the Balance Bead onto the open clasp with the textured side against your skin. Step Three: Close your necklace as you typically would.